Homemade ice pops are our favorite snack at home! We are always trying new flavors and looking for fun molds. Mixed berries ice pops are so yummy and full of health benefits! Berries are great antioxidants and eating mixed berries ice pops can help improve your health, protect your hair, your skin and prevent certain diseases. Fresh is always better but frozen (unsweetened) berries are a good substitute during the off-season months — and just as nutritious! I was out shopping for a small glass container and found new molds that my son is now super excited about. You can find Monster Fun Ice Pop Molds by MSC – Set of 4 online too. I read recently that adding a bit of sugar to homemade ice pops makes them softer. One of the problems with my homemade ice pops is that they come out a bit hard. I will follow the advice and see what difference it makes in the texture. I know that adding sugar will not be the smartest idea to our homemade healthy treats but still by far better choice than store bought versions full of high fructose corn syrup, chemicals and artificial colors. Hey, we all need a little bit of sugar in our lives right? Blend all ingredients together. My Vitamix is the best blender for making smoothies. Try the blend to see if it needs a little more honey/sugar depending on how sweet you like your ice pops. Remember that when frozen, ice pops will loose some of the sweetness so take that into consideration. We are using our new molds, aren’t they fun? 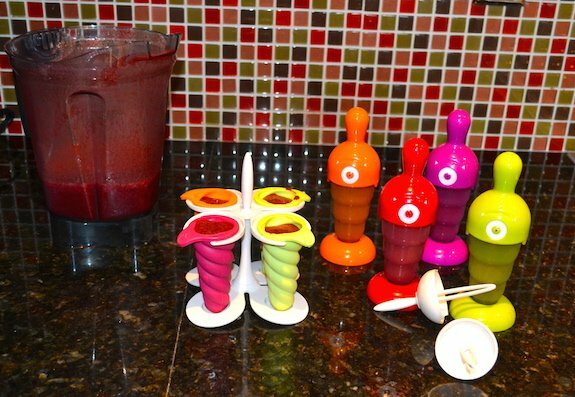 This recipe will make about 8 small mixed berries ice pops and about one cup of smoothie. 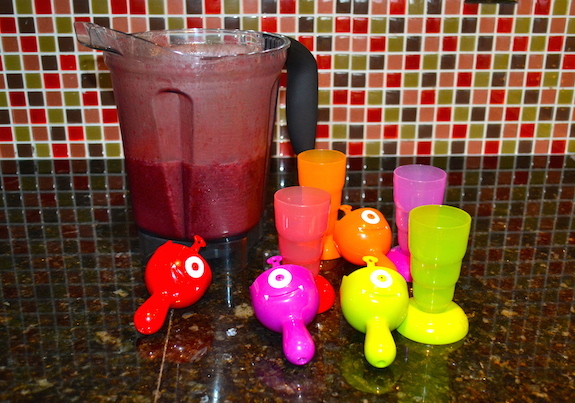 We also used our Orka Molds (our favorite molds). They are small and easy to clean, great for small children. We will see how the new molds work and if they are easy to remove once they are frozen. Freeze the ice pops for a couple of hours and then enjoy your mixed berries ice pops while they last! for more ice pops recipes, please see my Great Snack Idea: Ice Pops! post. Success! The ice pops came out perfect! Not “rock hard” with the help of a little sugar. The monster ice pops are great! Came right off without having to run warm/hot water first. They are a little bigger than the orka molds but they are not super large pops. Our orka molds have silicone covers so they come right off always! Mixed berries ice pops are so delicious! I couldn’t resist having one too! Refreshing, natural and satisfying as always!